IT IS TWO DAYS AFTER THE OPENING NIGHT OF VICKI VAN HOUT’S NEW DANCE WORK BRIWYANT (FOR ‘BRILLIANT’). WE ARE IN BAY 20 AT CARRIAGEWORKS, THE SPACE WHERE THE PIECE IS PRESENTED. IF VAN HOUT FEELS AT ALL PLEASED WITH THE POSITIVE FEEDBACK HER LATEST WORK HAS RECEIVED FROM AUDIENCES, PEERS AND CRITICS ALIKE (P32), SHE CERTAINLY DOESN’T LET ON. “THE WORK ISN’T DONE YET,” SHE SAYS MATTER-OF-FACTLY. 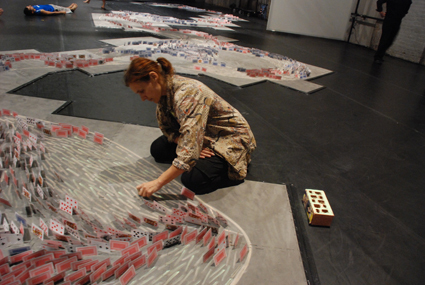 And it’s easy to see what she means: The cavernous theatre space is split into two by an enormous river-like installation made up of several thousand playing cards. After every performance, each card needs to be reglued to the ground edgewise—a complicated procedure that takes up to seven hours. An activity expected from an installation artist maybe, but from a choreographer? And go for it, she did. Working incessantly over the following years, Van Hout has steadily built a reputation as one of our most interesting and prolific independent dance artists. She has developed a growing following for her deftly imagined and thoughtfully crafted works examining urban indigenous realities, especially in NSW. Briwyant is Van Hout’s third full-length work. Conceived as a cross-cultural, inter-disciplinary dance piece, it examines the ongoing nature of ‘traditional’ Aboriginal practices based on story telling through the act of painting. As in many of her works, van Hout aims to explore the commonality between traditional and urban cultural experiences and how indigenous cultural information is disseminated: “I’m interested in what was, what is and what is similar. I’m always trying to find what is contemporary and relevant.” The work started out as an idea for a solo and evolved into its current form featuring six performers including herself. This might explain Van Hout’s extensive engagement with dance outside exclusively indigenous contexts. In the last few years she has created numerous works for both tertiary institutions and youth dance companies such as ATYP, youMove, fLING Physical Theatre and DirtyFeet, as well as WAAPA, to name but a few. She also frequently employs non-indigenous dancers for her works. The cast of Briwyant, for example, is decidedly mixed. “We’re an eclectic bunch, no one is the same,” laughs Van Hout. And there is no question that she likes it that way. It confirms her fascination with juxtaposition, a device she frequently employs in her works.